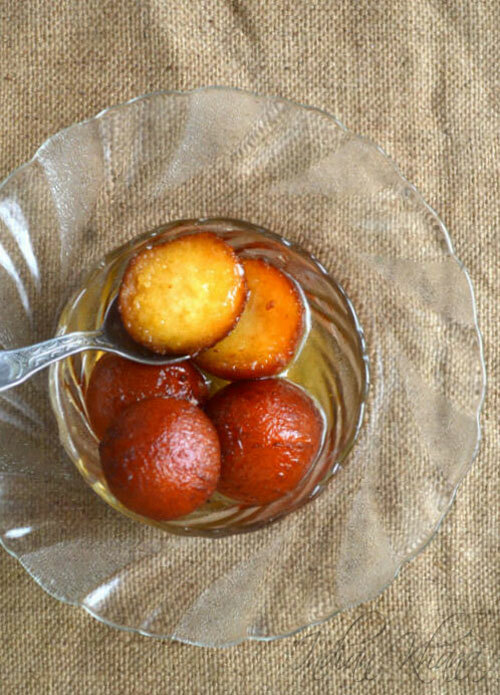 Gulab Jamun is India's one of the most popular sweet, the most common sweet to celebrate any occasion whether it's small or big gulab jamun is must. 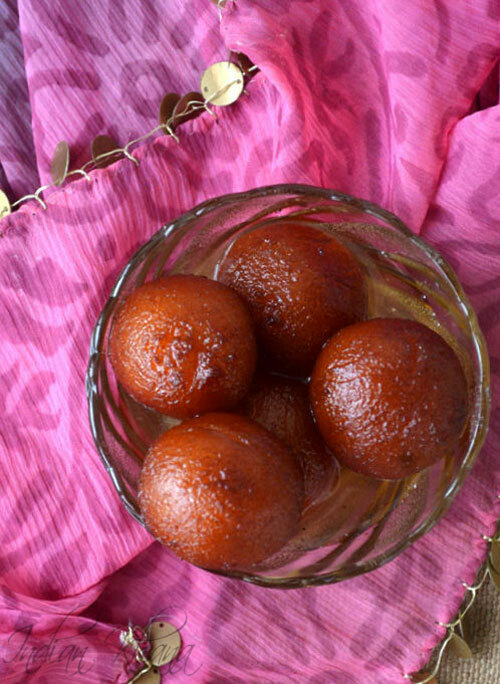 In our home during Raksha Bandhan, Diwali, Holi, birthday or family gathering gulab jamun is on the menu. 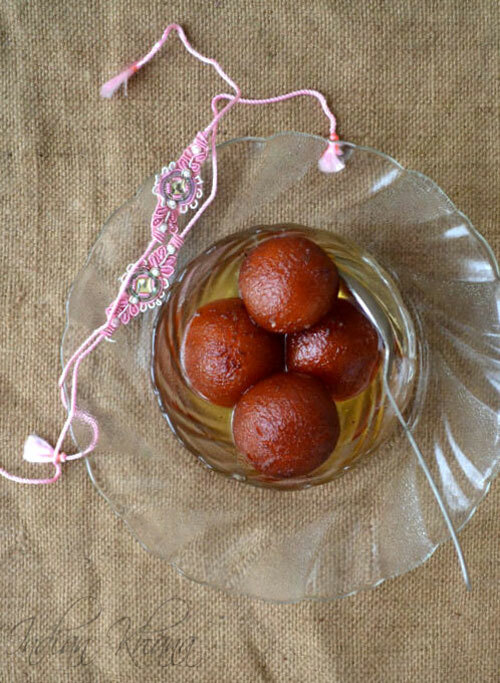 Authentic gulab jamun is prepared with khoya and it taste delicious but now a days milk powder gulab jamun is popular when short of khoya. this milk powder recipe comes very handy. Milk powder balls fried until golden brown and soaked in sugar syrup. 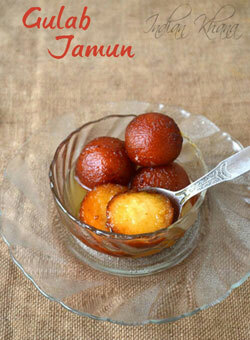 Simple, easy to prepare Gulab Jamuns is treat to eat any time hot, warm, cold or at room temperature. 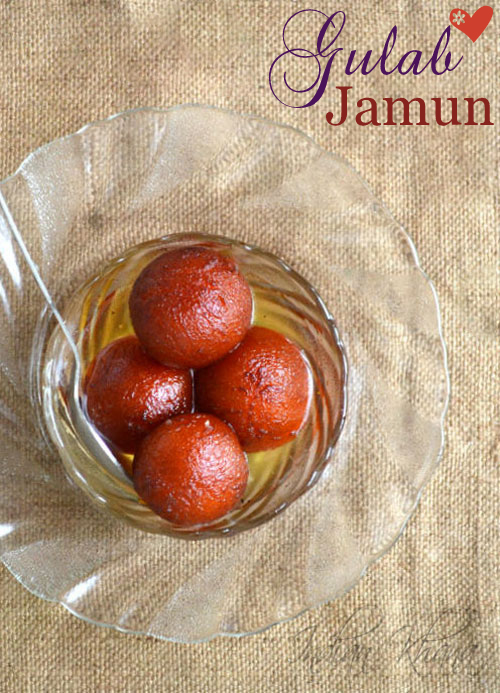 To make it a great party dessert serve warm gulab jamun with vanilla ice cream, you, your guest, family will love it to core. My SIL always makes gulab jamun for Rakhi and this year I tied Rakhi to my rakhi brothers so made again the glorious jamuns to go along the celebration since we had over dose of sweets at home with 3 birthday celebration on same day, relative visiting so instead of doing any elaborate sweet I decide on the ever green favorite Gulab Jamun and instead of khoya made with milk powder with my SIL help. We had power cut for 2 days due to heavy rain so that particular day I suggest to do full cooking in Aagan instead of fighting in kitchen with heat and the idea was huge hit and that's the reason few step by step pictures having harsh sun light. 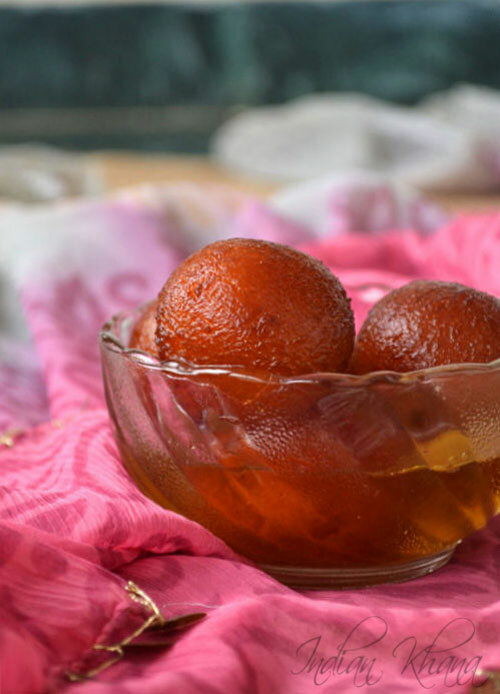 If you are yet to decide what to sweet to prepare for Raksha Bandhan then try this easy and quick gulab jamun and your brother(s) will be happy for sure. Here wishing all celebrating the beautiful bond of Brothers and Sisters Very Happy Raksha Bandan (Rakhi) whether you are celebrating it today or tomorrow. Have a great celebration. 1. Prepare sugar syrup for that in a large vessel or pan add sugar, water and bring it good boil. Add cardamom powder, rose or kewra water if using and keep boiling until syrup starts to get thicken and we get 1 thread/string consistency, remove any scum and off flame. 2.In a bowl whisk or sieve milk powder, maida, soda well. Add butter or ghee and rub with palms to combine it well with flour mixture. 3. Add milk in small quantity and make soft pitiable dough. Knead for 4-5 minutes to make it smooth, cover and keep aside for 10 minutes. 4. Divide dough in equal 20-22 pieces and make smooth balls. Heat oil or ghee in a wok, first drop only one jamun or small pieces fry to check if oil is hot enough, when dropped in oil jamun it should take a minute to rinse in oil (if it rinse faster then oil is too hot, in this case off flame and allow oil to cool). 5. Deep fry 6-7 prepared balls/jamuns in low to medium flame until dark brown, keep stirring/rolling regularly so jamuns gets brown evenly. Do same for rest of jamuns/balls. 6. Allow fried jamun to cool for 2-3 minutes then drop in prepared sugar syrup and allow to soak minimum 30 minutes. Garnish with almond or pista slivers if using. Serve warm, cold or at room temperature and enjoy irresistible jamuns.